How will the Land-Use Framework affect Kananaskis? The Alberta government released their Land-Use Framework (LUF) policy on December 3, 2008. 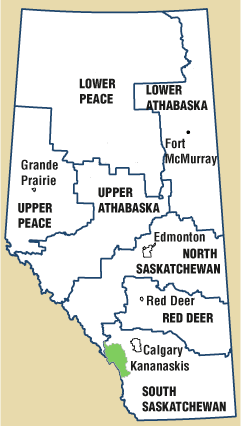 Kananaskis is part of the South Saskatchewan Region, one of the seven regions that partition Alberta by watershed and municipal boundaries. The Save Kananaskis group is dedicated to creation of a park in Northeastern Kananaskis to protect the social and economic value a protected natural landscape would provide Calgarians (as the largest user group) and Albertans in general. Kananaskis provides 40% of Calgary's water. It is a favourite destination for recreation where people live, grow, learn, get fit and generally draw sustenance from their experiences there. Visitors to Kananaskis buy products and services from businesses in gateway communities, from outfitters, event organizers, outdoor equipment retaillers and other tourism and recreation businesses. Real Estate values for properties adjacent to Kananaskis are affected by how the land inside the natural area is used. On the face of it, the Framework seems to be well intentioned, but as with most public policy in Alberta, they talk a good line but don't walk the talk. With that in mind, these are some of the relevant statements taken from the plan. What does the government intend to achieve through the efficient use of land strategy? We will propose and implement strategies to reduce the environmental footprint on public and private lands. It is the underlying principle that will guide all land-use planning and decision-making on both public and private land. Why does Alberta need a Land-use Framework? Oil and gas, forestry and mining, agriculture and recreation, housing and infrastructure - all compete to use the land. The Land-use Framework creates a balance among economic, social and environmental interests in the land. It is a significant step forward in the evolution of land-use planning and decision-making in Alberta. provide greater certainty for Albertans and industry in planning and carrying out activities on the land. The Land-use Framework will use a cumulative effects management approach. What is this? The province will use a cumulative effects approach that looks at the potential impacts of all projects within a region, rather than at the impact of development on a project-by-project basis. Will there be opportunities for stakeholder input on the development of regional plans? The Regional Advisory Councils will consist of 10-14 members representing the range of interests within each region, and who are able to appreciate the broad interest of the region, including provincial and municipal governments, industry, non-governmental groups, and Aboriginal communities. How does the framework affect recreational activity on public land? The goal of this strategy is to ensure Albertans continue to have a wide variety of recreation opportunities on public lands, while at the same time minimizing the impact on our natural environment, reducing conflicts and increasing cooperation. How will the Land-use Framework impact private landowners? Municipalities already have the ability to control the subdivision of land under the Municipal Government Act. Landowners can only subdivide with municipal approval. Regional plans will set the context for these decisions in the future and could identify areas where the fragmentation and the loss of agricultural land needs to be addressed. Alberta Sustainable Resource Development initiated a study in 2007 to guage public opinion on a number of management issues. rapid economic development and accompanying land-use activities have implications, not only for the land base but also for Alberta’s watersheds and air quality.